The idea for this week is inspired by the Nintendo 3DS and the upcoming movie the Smurfs (due to be released 2011). In this game of mini games you choose the Smurf with the abilities that best match the task as you hunt around New York collecting the smurfs back together again. The Nintendo 3DS will have many new features. This game will exploit these features and also ties in to an upcoming movie. 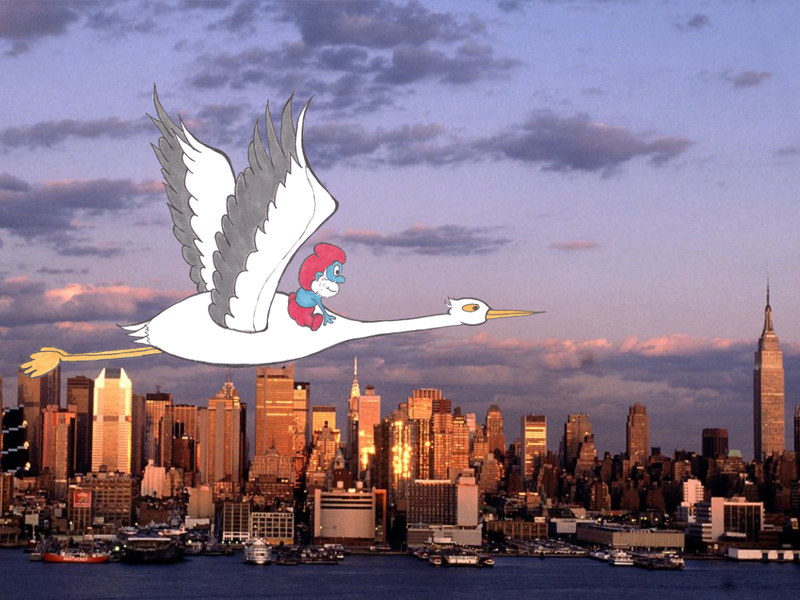 The Smurfs arrive in New York and are scattered about the city. You start the game as Clumsy Smurf and must travel the city to find all the other smurfs. You find and collect the smurfs by completing mini-games. As you find the other smurfs you can use their skills to conquer new mini-games and so collect new smurfs. Flying on a stork in 3D through New York's streets, just above car level. In this game you use the accelerometer and gyroscope to control the direction the stork flies. Collecting smurfberries by running about a kitchen. Making potions by selecting the correct ingredients with the stylus. Other smurf-tivities such as: baking, painting, lifting weights and so on. The smurfs never compete against each other. Instead, in the mini games you are battling against the environment or Gargamel to free other smurfs and eventually find your way back to the smurf village. Each mini-game can only be completed by smurfs who have the correct special abilities. This means that some mini-games will not be able to be attempted until the player has collected at least one of the smurfs required for that mini-game. At the start of the mini-game, if there are multiple smurfs that can do the mini-game, the player is given a choice between the possible smurfs. Players will be able to create their own smurfs by changing the clothes and accessories of their smurf, although the skin will always be blue. Players can also take photos of themselves and smurfify themselves by turning their skin blue. Players will get points if they share their smurf creations with others and will also get points for having the most number of different smurfs. Player smurfs can be swapped automatically using the new tag mode of the 3DS while the device is sleeping. That way when a player starts up their game again, they'll be able to see new smurfs gathered from the people they passed by. Players will also be able to compete together in mini-games. As stated above, smurfs never compete smurf vs smurf, however, the games can be tackled together to conquer Gargamel or other obstacles. All the mini-games available in single player mode will be available for multi-player mode and several new mini-games will be available that require multiple smurfs with different abilities. The mini-games will be quick and simple to play, yet players will want to keep doing just one more mini-game. Players will want to collect all the smurfs and will continue to play to unlock new ones. This game has no affiliation whatsoever to the Smurfs movie. This is just an idea and there are no plans to create this game or commercialize it in any way.